I received this ebook from NetGalley and Houghton Mifflin Harcourt Children’s Book Group, in exchange for an honest review. Lyric Walker’s life is changed as she watches 30,000 Alpha, a multi-nation, ocean-dwelling race emerge on the beach in Coney Island. While the world is initially awed, it’s not long before the prevailing attitude turns to suspicion, and paranoia. Violence breaks out, and Lyric’s town becomes a military zone. Three years later it’s decided that to help diffuse tensions, six Alpha teens will integrate the local high school. Sixteen-year-old Lyric is assigned to help assimilate the Alpha’s prince and she soon realizes there a lot more to him than his prickly exterior. They develop feelings for one another, but this is extremely dangerous, as many on both sides, wish to keep them apart. As Lyric learns more about the Alphas, it becomes clear that they are not the enemy. Indeed, there is something far more dangerous approaching from the depths of the ocean, and the Alphas may be humanity’s only chance at survival! 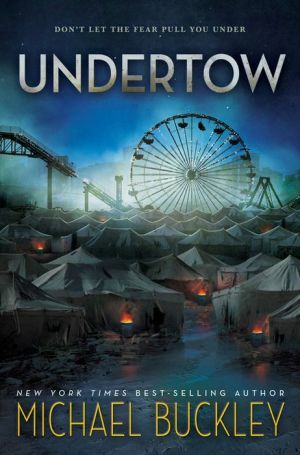 Undertow is one of the most original and imaginative books I’ve read in a while. I just finished last night and my thoughts are still racing, so I hardly know where to begin. Well, first, let me warn you that the Alphas aren’t like the sweet, beautiful seafolk as portrayed in Disney’s The Little Mermaid. They’re actually made up of five nations with different physical appearances and abilities. What they have in common is they’re all highly intelligent and they’re fierce warriors. In fact, most of the book had me wondering why they allowed themselves to be segregated to this small stretch of beach for three years. If you look at the cover, it will give you an idea of the living conditions. Lyric was a bit of a wild child when the Alphas first made their appearance, but after discovering a family secret, she’s learned how to keep her head down, and to not attract attention. She’s smart, tough, and resourceful. In essence, she has all the qualities you want to see in a female protagonist. She suffers from excruciating migraines, which as a migraineur myself, I could empathize with. Despite everything, she’s popular with her classmates and possesses the unique gift of being able to bring different groups together. When the new principal forces, ahem, requests her assistance, it’s not really a big surprise. The relationship between the Alpha prince, Fathom, and Lyric, develops slowly through the course of the book. They start out extremely supicious of one another, but as they spend more time together, they realize they are more alike than they thought. Fathom isn’t the most likeable character at first. He’s arrogant, quick to anger, rude, and not very appreciative of Lyric’s diplomatic efforts. But there are so many more layers to his complex personality. Once he and Lyric start getting close, she brings out his better qualities. There are some real nasties in this book, including Fathom’s father, but I think my favorite character I loved to hate was the governor, who could have been Dolores Umbridge’s sister from Harry Potter. Same smarmy mannerisms, same xenophobic views. At its heart, this is a book about prejudice, domestic abuse, politics, government control, and more. Sometimes when an author attempts to tackle too many issues, their work just gets bogged down with details, but this is not the case here. Michael Buckley does a masterful job balancing these issues, which can be taken from today’s headlines, without taking away from the fascinating story itself. His writing style is full of emotion, and you won’t be able to stop yourself from connecting with the characters. While much of the book is dark and suspenseful, there are lighter moments interspersed, mainly thanks to Lyric’s best friend Bex, who despite her abusive home life, manages to still see the humorous side of things. The only thing that prevented me from giving this 5 stars, was that after a slow and steady build-up, I felt the ending was a bit rushed. This is going to be a trilogy, so I’m quite interested in seeing how this story further develops. Really enjoyed this review, Kim! It definitely feels like a book worth checking out. Thanks K’lee! It was quite different, in a good way!